Amy Pond: I thought…well, I started to think you were just a mad man with a box. Here it is! 🙂 The dodisharkicorn lives! What is your third favourite colour? Would you rather be: a Jedi, a Pokemon Master or a Wizard/Witch? Choose ONE. Would you name your child Sirius Albus? Do you own a lawnmower? Do you think Legolas is a (very pretty) pansy? What’s the trashiest thing you’ve read in the last year? Should we cover it for Trashy Tuesday? To set a shining example, I will now answer these difficult questions to the best of my ability. Enjoy. 1. My third favorite color is emerald green. 2. What would I rather be? It’s a very tough choice between a wizard/witch and a Jedi, but I think I’m going to have to go with Jedi Knight. I once dressed up as one for work — I teach in a high school — for a themed costume day. The theme was “Come Dressed As What You Want To Be When You Grow Up,” and when I was a kid, Jedi was high on my list. My costume was awesome. 3. My favorite Doctor is probably David Tenant because I like his other work. Sadly, I missed the boat on Doctor Who decades ago and have only a fleeting familiarity with it. Heresy, I know, and I hope you will all forgive me this severe cultural transgression. 4. I cannot whistle and am thus an embarrassment to my family and to my species in general. 5. I would name my child Sirius Albus if his father were Harry Potter. Beyond that, this is an exclusively theoretical question, so I’ll just say, sure. Why not. 6. 42. This one’s almost too easy. RIP Douglas Adams, you betoweled hoopy frood extraordinaire. 7. I own a lawnmower in the sense that my husband has one, and what’s his is mine and what’s mine is his. But you’re not likely to see me lay a finger upon said lawnmower, unless it needs to be moved from behind my car before I back out of the driveway because my husband left it there. Reciprocally, my husband has a collection of absolutely exquisite hats he wouldn’t touch with a thirty-nine-and-a-half-foot pole. I like to wear them when I go out for tea. 8. Yup, I sure do. 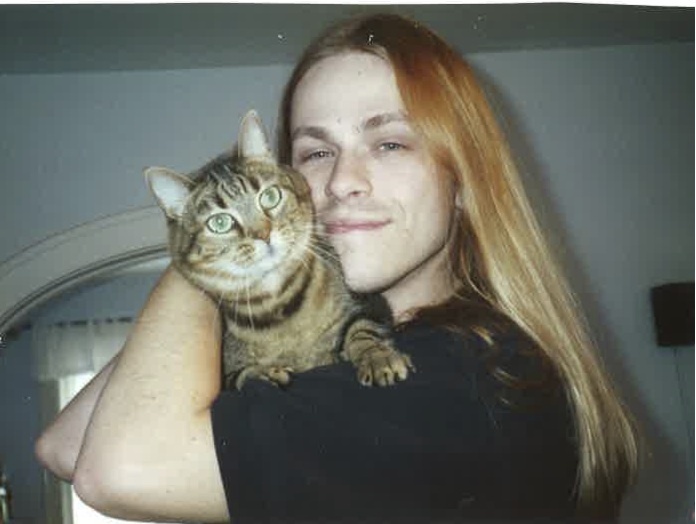 Please observe this photograph from very shortly before Peter Jackson’s first LotR movie came out, of my darling husband who is as unpansyish as a man can get and still be intellectual and liberal, and of his cat who is no longer with us. For further evidence of his unpansyishness, see the note about the hats, above. My cute hubby with his cat Sarah Jane: He looks sort of like Beowulf, don’t you think? 9. Although there’s a tough competition between this and any of the Sookie Stackhouse novels, I think the trashiest thing I’ve read lately must be A Hunger Like No Other by Kresley Cole. Please feel free to cover it for Trashy Tuesday. I’m not sure I could do it TT justice myself, although I might blog about it at some point in the future. I promise, I do read quality stuff, too, most of the time! In fact, Cole’s book really didn’t have much competition here. So that’s all! Have a good week. 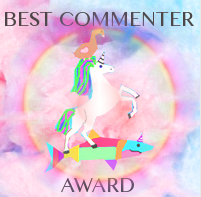 Award winners, comment here with your answers and demonstrate just how awesome you are, and how sincerely you deserve this award!